Over the course of the last week I’ve been visited by a few insects. While the appearance of a spider or pretty much any other insect on a vehicle is nothing to make a case out of, I began to take notice when I was visited by two spiders and a praying mantis–each before a negative event or a major decision involving a vehicle. The first encounter was last Friday evening with a sizable spider. The spider appeared to be making the inside of my Chevy Caprice it’s home. It had spun webs throughout the interior of my car and camped out in the passenger seat. Being an arachnophobe I had no intention of leaving the spider in my car. I tried to shoo the spider from the car but it took refuge somewhere under the passenger seat. I drove home, on edge, but I did not see the spider again that day. The next morning as I was heading out for the day I noticed the spider had again spun webs throughout the car. This time it was camped out in the drivers seat. I managed to remove the spider from the car and I headed out for the day. When I engaged the car’s brakes at a stop sign down the road, the brake pedal dropped to the floor. One of the rear break lines had corroded and blown out. I was able to return home without incident and make repairs. My next encounter occurred on Wednesday morning. I was taking my Lemon Camry back to the dealer for additional servicing. 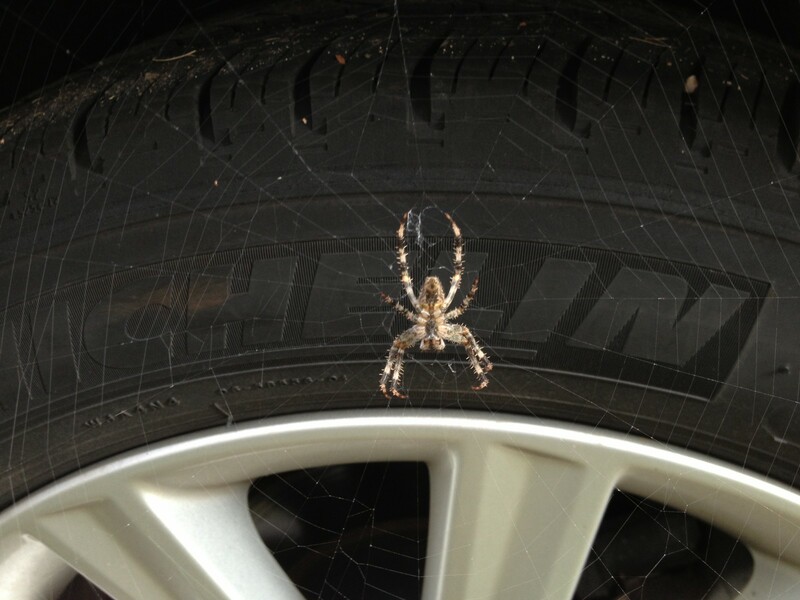 A sizable spider had spun it’s web in the drivers side rear wheel well. It was easily knocked down and I drove off. Once I reached the dealership I was faced with the prospects of having the car disassembled for yet another repair attempt. The third and final encounter was with a praying mantis Saturday afternoon. With the ongoing issues with the Camry and it’s warranty about to expire I was visiting dealerships looking at some potential cars to trade into. 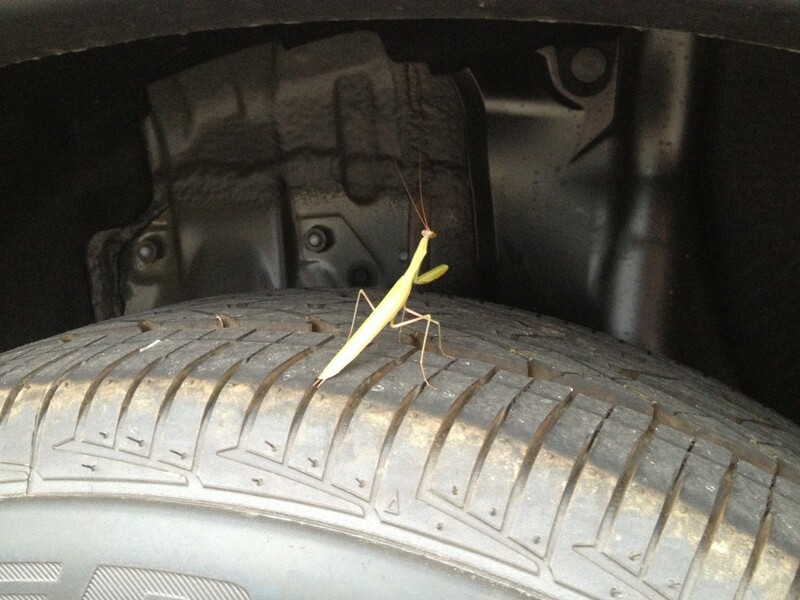 While looking over one of my options Cathy noticed a praying mantis camped out on the top of the drivers side rear wheel. I’m not a very suspicious person but at this point I started to wonder if there was some sort of symbolism connected to these insect encounters. Are these insects offering guidance with my cars? Something else in my life? are they just insects acting like insects? Maybe it’s just coincidence. Maybe I’m just getting suspicious in my old age. Either way I’m going to start paying more attention to the creepy crawlies in my life. 2 Responses to Bug Signs? The message seems clear to meâ€”avoid the spiders and follow the praying mantis! Correct me if I’m wrong, the praying mantis was sitting on the Honda CR-V?